Photo: Leaders stand behind Frank Curtis as he concludes his sermon. Sunday’s coming. That’s a great thing if you’re talking about the resurrection of Christ. It’s also good news to the believer who has survived a difficult week at work, and just needs an encouraging word from the pastor. But the pastor needs an encouraging word from time to time, too. For pastors, Sunday is always coming, and that can often be an exhausting realization. But every year at the beginning of May, pastors in the Church of God know they have a place to go. A place for fellowship with other pastors. A break from the pressures at home. An encouraging word tailored just for them. Pastors’ Fellowship refreshes hundreds of Church of God pastors and laypeople every year, and 2016 was no exception. Focused on the Holy Spirit’s role in the church, those who attended Pastors’ Fellowship 2016 not only heard the Holy Spirit preached, but also experienced a fresh anointing. Photo: Church of God Ministries’ Handel Smith with Ron Fowler. Zechariah 4:6 asserts the essential nature of the Holy Spirit—“‘Not by might nor by power, but by my Spirit,’ says the LORD Almighty” (NIV). 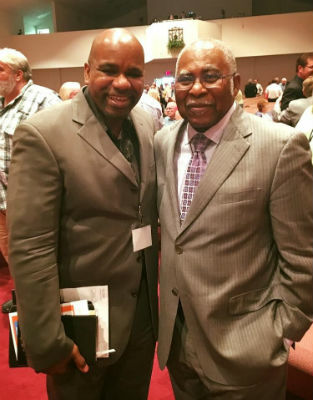 The theme verse of Pastors’ Fellowship 2016 set the stage for what proved to be two days of inspirational worship and biblical preaching that pastors and laypeople would be hard-pressed to forget. 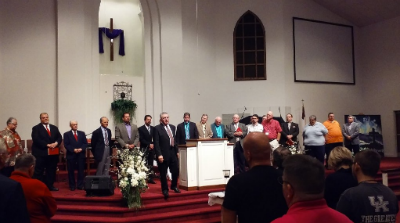 It wasn’t just the eight impassioned sermons packed into just twenty-eight hours that strengthened these pastors’ convictions and nourished their souls. It was also the variety of conferences offered in partnership with the Kentucky School of Ministries. From the Servant Solutions conference on ministerial finances, to one entirely devoted to the “anatomy” of a sermon, seasoned leaders poured their time and talent into practical, enriching dialogue. Following these morning conferences on opening day, Pastors’ Fellowship attendees were primed for a spiritual feast on the Word. Attendance at this year’s Pastors’ Fellowship represented a wide cross-section of the Church of God from various regions of the country, as well as Canada. Church of God colleges and universities were represented, and the president of Mid-America Christian University—John Fozard—was featured as a speaker. 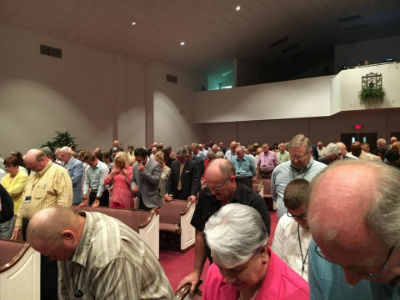 A powerful pictorial tribute was offered to the late Bill Neece, whose impact on Pastors’ Fellowship and the Church of God cannot be understated. Throughout each day of the event, four-part harmonies rang out the rich lyrics of timeless hymns in the vast expanse of First Church of God, Winchester, Kentucky. Talented trios, high-quality quartets, and family ensembles graced the platform with special music selections that drew listeners close to God. The Holy Spirit moved in powerful ways as the saints responded to God’s Word, kneeling at the altar and finding restoration and renewal. Photo: Powerful prayer time at Pastors’ Fellowship 2016. Frank Curtis warned listeners not to fall into the trap of holiness as a legalistic list of dos and don’ts. Reflecting on holiness as an issue of the heart, he said, “When we allow the Holy Spirit to do a work in our hearts and lives, we will not be the same.” Talking about spiritual leaders, MACU president John Fozard said, “All other spiritual gifts are desirable, but being filled with the Holy Spirit is indispensable.” Other excellent speakers included Darryl Allen, Gerald Rudd, Mark Jackson, and Ben Murphy. Pastors’ Fellowship is yet another example of where God is on the move in the movement today. The next Pastors’ Fellowship is scheduled for May 1–2, 2017. That’s still a long way off. Be sure to offer your pastor several healthy doses of encouragement between now and then! This entry was posted in All Church of God, Southeast and tagged conference, First Church of God, Holy Spirit, Kentucky, Pastors' Fellowship, Winchester. Bookmark the permalink.